Tom Zeisler, Resource Data Supervisor for the St. Louis County Land Department, has been a quiet leader and innovator in GIS since the mid-1980s. Under Tom’s leadership and vision, St. Louis County became one of the earliest organizations to implement a resource management-based GIS program in local government. His leadership of and success with the Land Department’s GIS established the foundation for the development of the Land Information Portal in the County. Additionally Tom has been a strong advocate for collaboration between county departments, adjacent county resource managers and the state of Minnesota. He has been a long time participant with the GIS/LIS Consortium, attending or presenting at nearly every conference, and serving as an instructor at GIS/LIS workshops. 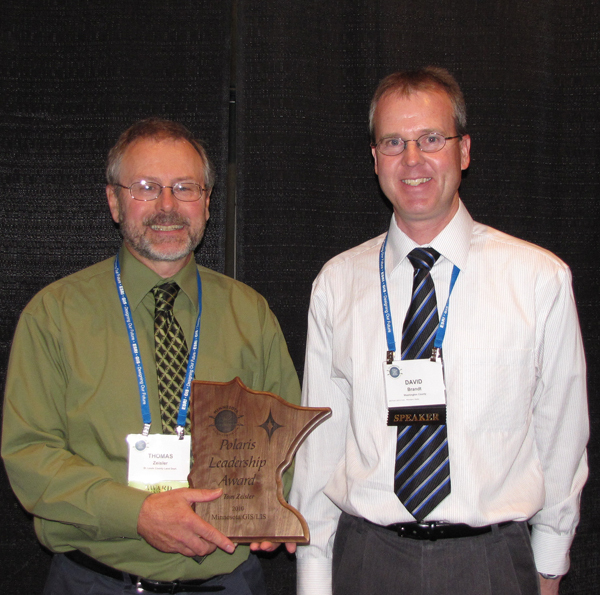 In summary, Tom has been an effective proponent for GIS in northeastern Minnesota. With his dedication and leadership, Tom has assisted in making GIS a common business application in natural resource management. 2010 Polaris Award recipient Tom Zeisler with 2009 Polaris Award winner David Brandt..